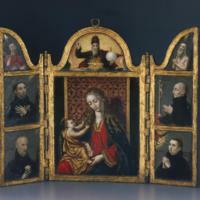 The central image of this triptych, which could be folded and closed to cover the paintings, was created by one of the best known early painters of Peru, a Spanish-born Jesuit named Pedro de Vargas (b. 1553). After the image of the Virgin and Child was created, it was set in a gilded frame that also envelopes smaller images of God the Father and saints. The style of painting owes a great deal to European models, which was not unusual in viceregal Peru. At the top of this hinged painting, God the Father appears here as an old man, holding an orb that represents the earth. Below him is the Holy Spirit, represented as a dove surrounded by golden rays. On wings of the left side are two Jesuit saints, Francis Xavier and Francis Borgia. They were both beatified, and then canonized in the early 17th century. At the top of the right wing is Saint Ignatius Loyola, the founder of the Jesuit order. Below him is Stanislaus Kostka, who was beatified in 1605. The presence of 17th century saints suggests that the elaborate triptych may have been created somewhat later than the image of the Virgin. In the central panel, the Virgin Mary tips her head towards the Christ Child. She holds him gently, as if barely supporting him. The behind her drapery is sign of luxury in the painting. Not only is it golden in color, but the wrinkles and folds suggest an abundance of cloth. The fur-lined sleeve and gold-trim of the Virgin’s red dress also suggest luxury. Pedro de Vargas (b. 1553) was one of the many known Jesuit architects and painters in Spanish America. Born in Andulusia, he came to South America as a soldier and once there joined the Jesuit Order. He worked primarily in Lima (where he collaborated with a fellow Jesuit and the most famous of the early painters in Peru, Bernardo Bitti), Cuzco and other cities high in the Andes, where the Catholic Church was eager both to build churches and to fill them with images. The imagery here was created with oil paint applied to copper, a technique brought to the New World from Europe. Although expensive, copper provided a flat and durable support for paintings. The copper sheet has been framed in gilded wood. After Pedro de Vargas created the central painting, another artist may have incorporated it into this small and delicately painted triptych. 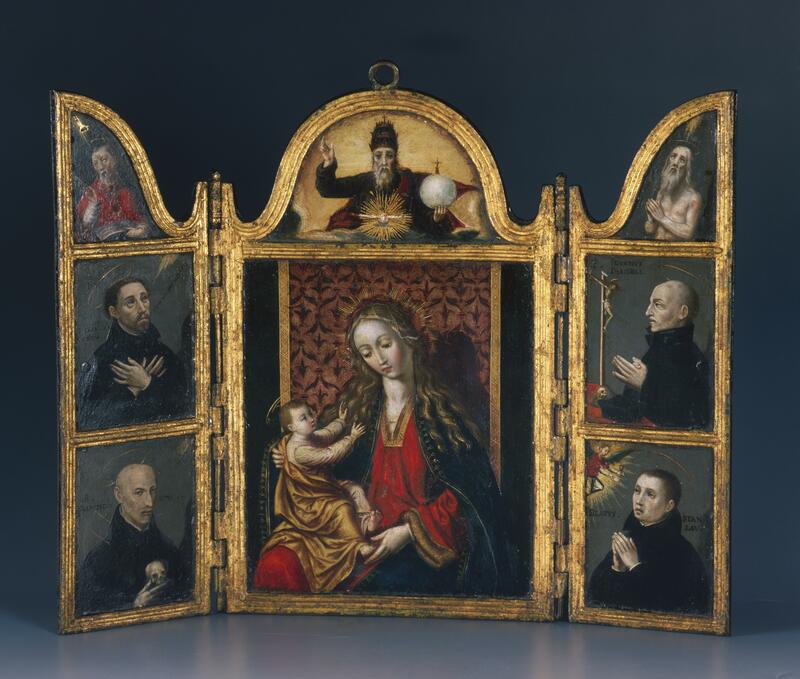 The patron may have been another Jesuit, because the triptych shows the Virgin and Child flanked with saints important to the Jesuit order, including its founder, Saint Ignatius Loyola. The triptych, which could be compactly closed, also seems a fitting form for a peripatetic priest. Today the work is in the Casa de Murillo in La Paz, Bolivia—not far from some of the towns where de Vargas was known to have worked. The decision by religious orders to dispatch European-trained artists and architects, like Bernardo Bitti, to Spanish America yielded its intended result: these artists and architects, who crisscrossed the colonies both creating works and training others, helped transplant European styles to the New World. And with the Catholic Church and the religious orders as their patrons, they and their students likely faced fewer of the economic uncertainties of other emigrating artists. Mesa, José de and Teresa Gisbert. 1991. La Pintura en los Museos de Bolivia. La Paz: Producciones Cima. Pintura en el virreinato del Perú. 2002. Banco de Crédito del Perú. Lima.